This 3-day auction is jam packed with more than 2,000 lots of important and historic firearms and related accessories, many coming from twelve renowned private collections of great quality, rarity and diversity. Probably the Highest Condition 1st Type Winchester Model 1873 "1 of 1000" Lever Action Rifle, estimated at $250,000-400,000. On Tuesday, October 31st, Wednesday, November 1st, & Thursday, November 2nd, James D. Julia Auctioneers of Fairfield, Maine will be conducting their annual fall Extraordinary Firearms Auction. The auction will open on Tuesday, October 31st with part one of the Extraordinary Session of the sale. This session includes over 750 lots of outstanding items. It leads off with an array of more than 100 high quality, high condition and engraved Winchesters. For serious Winchester collectors, the term "1 of 1,000" carries with it a level of prestige and significance that is unparalleled, and this sale includes not just one, but three fantastic Winchester “1 of 1,000” rifles. Starting with lot 1026, an extraordinarily rare and probably the highest condition 1st type model 1873 “1 of 1,000” rifles known. The special gun has great provenance and was one of the first 20 “1 of 1,000” rifles identified in 1950 by Universal Studios while doing publicity for their upcoming Jimmy Stewart movie Winchester ’73. Each of those first 20 rifle owners were presented with a new Winchester Model ’94 carbine, which is also offered in this lot, estimated at $250,000-400,000. From the prestigious lifetime Parker and Winchester collection of Dr. Tom Bouwkamp come several spectacularly engraved model 1866 rifles, including lot 1009, an extremely rare example engraved in high relief by John Ulrich which was displayed at the 1876 Philadelphia World Exposition, estimated at $100,000-150,000. Lot 1003 is an exceedingly rare iron frame Henry model 1860 from the US martial arms collection of Robert Roughton and carries an estimate of $75,000-125,000. The auction focus then shifts to Colts. The outstanding estate collection of confederate and historical arms of Morris Racker is unparalleled for its breadth of rarity, historically significant and unique firearms, including lot 1122, a Colt Paterson #1 baby percussion revolver estimated at $25,000-35,000. Lot 1123 is a very rare Colt Paterson No. 5 Texas percussion revolver. This exact revolver is pictured on page 147 of The Paterson Colt Book and carries a presale estimate of $75,000-125,000. Lot 1124 is a rare and desirable Colt Walker percussion revolver, B Co. No. 25, from the Roughton collection of US martial arms. Only 1,340 Walker revolvers we ever made, and very few remain today. This one is estimated at $100,000-150,000. This session also includes a selection of historic and important Colt cartridge firearms. Lot 1157 is an extremely rare engraved and nickel plated Colt medium frame Lightning rifle presented to the 29th President of Mexico, Portfirio Diaz, which is estimated at $25,000-45,000. The medium frame Lightning rifle was Colt’s first attempt at producing a pump action firearm and only a limited few were carbines and of those exceedingly few were so elaborately engraved with special plating as this one. One of the most spectacular guns in this auction is lot 1158, a Colt Single Action Army revolver in rare .44 Russian caliber. Coming from a prestigious private collection, this revolver is beautifully engraved by Wilbur Glahn with extremely well executed foliate arabesque patterns and ivory grips. Accompanied by a factory letter, this incredible revolver carries a presale estimate of $75,000-125,000. For years, Julia’s has been noted for marketing rare and important historical firearms and has handled more firearms from the infamous Battle of Little Bighorn and General George Armstrong Custer than any other auction house extant. Several firearms connected to Custer will be offered in this auction, including lot 1235 which is the most historically important long arm from The Battle of the Little Big Horn to ever come at auction, John Martin’s Springfield model 1873 Saddle Ring Carbine. Martin was Custer’s personal bugler and the only cavalryman attached to Custer at the time of the battle to survive. This historic rifle has been forensically proven to have fired a cartridge at the Battle of the Little Bighorn and is the only identified firearm ever found which has been proven to have been proximately with Custer during the infamous battle and carries a $175,000-275,000 presale estimate. Lot 1236 comes from the Racker collection and is one of the few firearms in private hands with documentation direct to General George Armstrong Custer, his National Arms Company Derringer. This gun has fabulous provenance and with an estimate of just $20,000-30,000 represents a fantastic opportunity to own one of Custer’s personal firearms. The Julia Company is also the unquestionable leader in the world today for rare and expensive Confederate and Civil War items. This sale includes over $1 million of Confederate treasures. From the outstanding estate collection of Confederate and historical arms of Morris Racker comes lot 1244, an extremely rare Cofer Confederate revolver, serial number 11. Serial number 11 is by far the finest example known and was the prize revolver of renowned Confederate collector Fred Edmunds prior to purchase by Racker. Its presale estimate is $100,000-150,000. Also from the Racker collection is a very fine and rare Confederate Dance Army revolver, serial number 14, offered as lot 1245. This revolver has outstanding provenance and is in excellent condition for a Confederate revolver and is estimated at $40,000-60,000. Speaking of rarity, lot 1246 is the only known surviving example of a 1st model, 1st type Spiller & Burr revolver, serial number 13, from the Racker collection and estimated at $30,000-50,000. Lot 1281, also from the Racker Collection, is a scoped 2nd quality Whitworth sharpshooter’s rifle estimated at $40,000-60,000. From the Confederate and Civil War Estate Collection of Fred Donaldson comes lot 1284, a fine “as found” brass frame Confederate Morse carbine made in Greenville, South Carolina estimated at $15,000-20,000. Among the fine offering of antique arms in this auction is lot 1339, an iconic silver mounted Hawken rifle, known as “The Atchison Hawken.” This is no doubt the finest and most elaborate of all Hawken rifles, and until now has never left the family descent of E.R. Butterworth who obtained the gun on his travels west in the 1870’s. This gun has been on public display at the Cody Firearms Museum for the past 20 years and is original and complete in every regard. It is estimated at $80,000-100,000. Another notable antique gun hitting the block on day 1 is lot 1345, a rare and finest known example of African American gunsmith James M. Jones. This beautiful percussion Derringer is elaborately engraved and considered a fantastic representation of Jones’ style, in beautiful “as found” condition with a conservative presale estimate of just $7,500-10,000. Antique Martial Arms also make a strong showing in this auction. From the Racker collection is lot 1346, a North & Cheney Flintlock pistol, serial number 816. These are truly the first American government contracted martial pistols, and this fantastic specimen is conservatively estimated at $30,000-50,000. The Harpers Ferry model 1805 pistol was the first American military handgun produced by a national armory, and this auction includes no fewer than eight US model 1805 Harpers Ferry pistols, including the last pair made, serial number 2048. Coming from the Robert Roughton Collection with great collection history, the pair is lot 1354 and carries an estimate of $20,000-30,000. This sale will include the largest offering of Virginia Manufactory arms to be offered at auction in many years, including lot 1355, a rare 1809-dated 1st model pistol assigned to the 3rd Virginia regiment and estimated at $8,000-12,000. Lot 1356 is a 2nd model 1812-dated Virginia Manufactory flintlock pistol also estimated at $8,000-12,000. Thirteen Virginia Manufactory long arms will be offered on day three. Other antique guns in this auction include a number of cased flintlock and percussion pistols. Lot 1549 is a spectacular pair of cased Joseph Manton flintlock dueling pistols. This fine pair of pistols is listed in “The Manton’s Gunmakers” and is estimated at $30,000-40,000. Lot 1535 is a superb condition cased pair of large double barreled flintlock cartridge pistols by Isaac Blissett. This is the finest pair of double barrel, spring bayonet flintlock pistols we have offered to date, truly extraordinary in every respect and estimated at $30,000-40,000. There are a number of highly desirable edged weapons in this sale, including some extremely rare Scagel knives. Lot 1386 is a Scagel camp knife in mint condition. This rare double-edged knife comes with its original sheath and is estimated at $20,000-30,000. Also on offer will be a very rare Scagel 14” hand axe estimated 1t $15,000-20,000. The Julia Company is the dominant force in investment quality sporting arms. For many years, they have consistently sold more high-end, rare and valuable sporting arms than any other auction house on the planet Earth, and this sale includes a number of exemplary examples of American and European sporting arms. The Estate Collection of Dana Tauber is unquestionably the finest collection of A.H. Fox shotguns ever to come to auction. Mr. Tauber favored condition over all other factors in amassing his collection of over 40 Foxes. There is no better example of this than lot 1403, an exceptionally rare (1 of 3) and extremely fine 20 bore A.H. Fox “FE” grade shotgun with special double dog gold inlays and accompanied by a Callahan letter. This spectacular shotgun is estimated at $150,000-$225,000. Lot 1404 is another “FE” grade shotgun, a 12 gauge also with double dog gold inlays in excellent condition and estimated at $75,000-$125,000. The third in a trio of “FE” grade Foxes is lot 1405, a superb 12 gauge with single trigger and breech ends that are engraved with 2-1/2″ triangles of large scroll and acanthus bisected by gold inlaid lightning bolts. Also in excellent condition, this lot carries a presale estimate of $60,000-90,000. Another of the most sought after American sporting arms is the Parker “A-1 Special” shotgun, and two will be offered in consecutive lots. The first is lot 1447, an exceedingly rare (11 estimated) 20 gauge Parker “A-1 Special” shotgun with unusual deep relief engraving estimated at $95,000-150,000. The second “A-1 Special” is lot 1448, a 12 gauge with fine scroll engraving from the prestigious and lifetime Parker and Winchester collection of Dr. Tom Bouwkamp. This very gun is described and illustrated in The Parker Story. It is estimated at $75,000-125,000. A fabulous offering of approximately twenty Winchester model 21 shotguns rounds out the American sporting arms category, and is highlighted by lot 1498, a historically important 20 gauge Winchester model 21 factory custom finished and gold inlaid shotgun presented to 5-star general and the first Chairman of the Joint Chiefs, Omar N. Bradley. General Bradley was the last of only nine people in the history of the US Armed Forces to hold the rank of 5-star General. 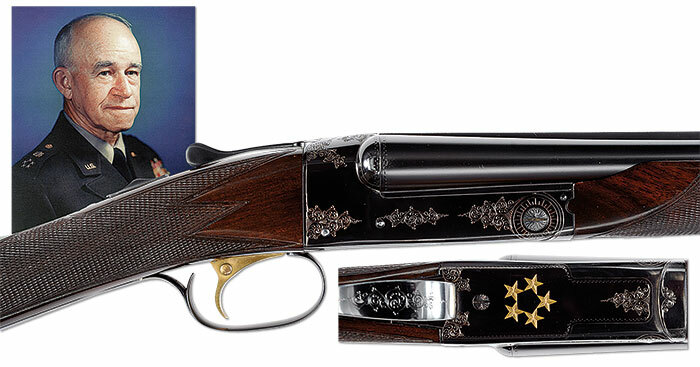 Instead of the usual engraving on trigger plate, this unique Winchester shotgun has five inlaid gold stars arranged around a pentagon, as is the insignia for the rank of 5-star general (General of the Army). This historic firearm carries an estimate of $100,000-200,000. Session/day 1 of the auction will close with antique and modern English/European sporting arms. Lot 1557 is a stunning and possibly unique James Purdy and Sons hammer underlever 8 bore double rifle. Purdey only produced a total of 768 hammer double rifles, making any Purdey double rifle extremely scarce and this world class example is estimate at $60,000-80,000. Another important early Purdey double rifle in this auction is that of R. Gordon Cummings is lot 1556, Used during his famous “Five Years in the Far Interior of South Africa,” one of the earliest accounts of sport hunting and travel in the African continent, this lot includes a first American edition two-volume set of these books published by Harper Brothers in 1851 and is estimated at $35,000-60,000. Lot 1560 is an Alexander Henry double rifle presented on Christmas of 1873 by Queen Victoria to her esteemed Scottish servant, confidante and alleged lover John Brown. It is hard to imagine a rifle with a more ironclad, interesting and romantic royal provenance than this one, and it carries a very reasonable $50,000-80,000 estimate. 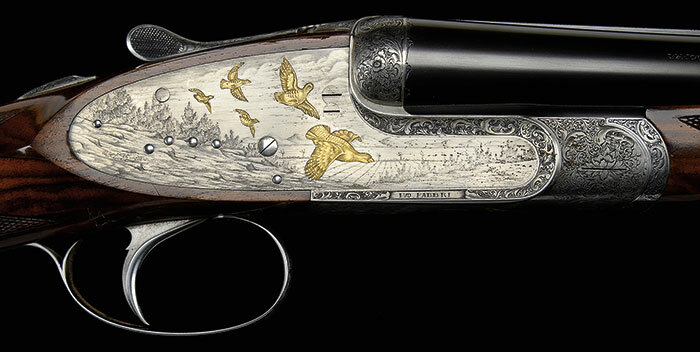 Another spectacular British sporting gun is lot 1590, a Holland & Holland masterpiece known as “The Swan Gun.” This fine gun with a unique relief engraving treatment was commissioned by Holland & Holland in the early 1990’s utilizing the extraordinary engraving talents of Rashid El Hadi, a self-taught engraver born in the Sudan. This spectacular “Royal” shotgun is estimated at $70,000-110,000. High art Italian sporting arms are well represented in this auction and of particular note is lot 1640, an Ivo Fabbri 20 gauge side-by-side shotgun engraved by C. Tomasoni with 14 gold bird inlays. A wonderful example of Italian design and craftsmanship, it is estimated at $50,000-75,000. Another Italian beauty in this auction is lot 1650, a 20 gauge Fili Piotti “Boss” over-under game gun with unusual chiseled rose and scroll engraving by G. & S. Pedretti. In addition to the attractive engraving, this shotgun has superb stock wood and includes case, estimated at $45,000-65,000. Rounding out the European sporting arms are over 50 German combination guns and drillings. These traditional European rifle/shotgun combinations are renowned for extraordinary quality and utility, providing a unique platform for hunting big game, small game, and wing shooting. Often overlooked in the U.S., these highly adorned firearms offer the advanced sportsman a lot of "Bang for the Buck." One historically significant example is lot 1682, Herman Goering’s superb Merkel 201E over-under blitz ejector double rifle. In excellent, original, “as found” condition, this lot includes extra rifle/shotgun and double shotgun barrels, three scopes, and original case. The provenance is ironclad and this package is estimated at $75,000-100,000. Lot 1683 is a very close to new and probably unfired J.P. Sauer model 30 Luftwaffe drilling with case. From the Bouwkamp collection, this is undoubtedly one of the finest examples of this firearm in existence and carries a presale estimate of $20,000-30,000. Session 2 on Wednesday, November 1st will open with part two of the Extraordinary Session of the auction, an unparalleled selection of military and Class 3 firearms and accessories. Lot 2068 is a massive Maxim Nordenfelt 37MM “POM-POM” Naval deck gun. Records indicate that this gun first went to Russia, and then later was in U.S. Naval Service during the Spanish American War, and it is estimated at $125,000-200,000. Lot 2010 is a superior cased and inscribed VL&D Mauser 1896 flatside automatic pistol of Civil War General James H. Wilson, West Point classmate of George Armstrong Custer. Estimated at $30,000-50,000, this is an outstanding and most historic pistol carbine in fabulous condition and a treasure trove of history. From session two of the extraordinary Warren Buxton collection comes lot 2016, a fantastic Walther Armee-Pistole in original condition with two matching magazines. This superb and all matching Walther AP test pistol is estimated at $27,500-35,000. Also from the Buxton collection is lot 2018, an extremely rare experimental Walther PP with unique mechanism and semi-shrouded/solid hammer which carries and estimate of $20,000-30,000. A superb DWM Swiss 1902 Luger carbine with matching stock and travel case is lot 2038 and carries a presale estimate of $17,500-20,000. Coming from a single-owner private collection is one of the finest groupings of quality Walthers to come to auction in many years. Lot 2024 is a historically important Walther PPK pistol associated to Emmy Sonnemann, the wife of Hermann Goering, estimated at $25,000-35,000. Also from this collection is lot 2026, a factory engraved cased Walther PPK pistol presented to senior NSDAP member Otto Marrenbach. This historic presentation Walther is housed in its red Walther factory presentation box and is estimated at $25,000-35,000. Offered from a private museum are seven rare vehicles, including a rare and desirable Soviet T-34/85 tank in lot 2063. The T-34 was arguably the best tank of the Second World War. This tank comes with much of its original kit and is estimated at $45,000-85,000. Lot 2060 is an incredible high condition 14-passenger Stoughton Bus. This rare restored vehicle most likely saw service in Pennsylvania ferrying passengers to and from the Ford Tri-motor and is estimated at $25,000-35,000. James D. Julia regularly sells more Class 3 arms that any auction house in North America, and this sale will include over 100 rare Class 3 and related items. Lot 2070 is an absolutely fantastic and exceedingly rare Colt 1919 BAR Monitor automatic rifle in extremely fine condition that is estimate at $50,000-75,000. This auction features a dozen specimens of the iconic Thompson, none finer than lot 2075 which is an absolutely fantastic high condition and extremely early Colt model 1921 Thompson serial number 935 estimated at $45,000-65,000. Lot 2083 is a rare and highly desirable Cadillac gauge Stoner model 63 LMG. This outstanding example of a landmark design in the history of U.S. military firearms development is estimated at $50,000-80,000. Lot 2093 is an Amnesty registered Curio & Relic eligible Chinese type 56 (AK-47) machine gun with two slings, bayonet, and two 30 round mags as well as signed and notarized history from U.S. Airforce pilot who acquired this gun during his combat tour in Viet Nam, and subsequently registered it during the Amnesty of 1968. It is offered with an estimate of $70,000-100,000. Lot 2102 is an iconic and highly sought after original German WWII MG-42 machine gun with tripod that is estimated at $35,000-40,000. And finally, lot 2167 is a Solothurn Swiss model S18-1000 20MM anti-tank gun with extremely rare original wheeled transport cart. This lot includes lots of extras accessories and is estimated at $20,000-25,000. Session 2 on Wednesday, November 1st will continue with part one of the Sporting & Collector Session of the auction. James D. Julia’s Sporting & Collector sessions feature moderately priced firearms and accessories, whose average selling price is in the range of $2,000-8,000. Encompassing the final two days of the auction starting with lot 2200, these sessions will feature nearly 1,100 lots of firearms and collectibles. The November 1st session with start with US and European military arms, featuring a variety of 1911s, M-1s, 1903s and 1917s. Session two of the extraordinary Warren Buxton estate collection includes a wonderful selection of Walthers, and this session will also offer some choice Lugers. The Robert Roughton collection of rare US martial arms includes more than 50 items military edged weapons, rifles and an outstanding selection of Smith & Wessons that will be offered in this session. The highly desirable Colt “snake guns” will make a strong showing with a number of outstanding Pythons and Diamondbacks on offer. American and European sporting arms will close out session two with a wide variety of items spanning such notable manufacturers as A.H. Fox, L.C. Smith, Park Brothers, Browning, and of course Winchester. Session 3 on Thursday, November 2nd will be part two of the Sporting & Collector Session of the auction. The final session of the auction will see over 500 lots crossing the block that represent some of the most outstanding buying opportunities of the three days. More than 60 desirable Winchesters of varying models will be offered, along more Colts and Remingtons. Session 3 of this auction will also include the most important offering of Virginia Manufactory Arms to come at auction in years, a total of 15 arms. Closing out this three-day firearms extravaganza will be American and European antique and martial arms, and a broad array of Civil War and Confederate items including long arms, pistols, edged weapons and other fine collectibles. Printed catalogs for this auction are available by contacting James D. Julia, Auctioneers and bids are now being taken. The entire online auction catalog with additional high quality photography and easy to use search tools is available at jamesdjulia.com. James D. Julia, Inc. is one of the top 10 antique auction houses in North America as measured by annual sales. It is headquartered in Fairfield, Maine. The company also has an office just outside Boston, Massachusetts in Woburn and has been in business for nearly 50 years. The company conducts high end, antique collectables and fine art auctions throughout the year. Julia’s has routinely established new world auction records through its sales events. The company consists of three key divisions. The rare Firearms Division in which they are the leader today for high end, rare and valuable guns. Julia’s next Firearms Auction is scheduled for Spring of 2018 and will again include a fabulous collection of spectacular arms. Their next Fine Art, Asian & Antiques Division auction will take place in February, 2018. Also, the Rare Lamp, Glass & Fine Jewelry Division, again a leader in this genre, will hold their next auction on December 1, 2017. Each division is regarded for its excellence and is staffed with world class specialists to ensure fair and professional authentication, identification and evaluation services. For more information on James D. Julia, Inc. please click here. James D. Julia, located in Fairfield, ME and Woburn, MA. Extremely Rare Iron Frame Henry Model 1860 Lever Action Rifle (Roughton Collection), estimated at $75,000-125,000. Colt Walker Percussion Revolver Company B No. 25 (Roughton Collection), estimated at $100,000-150,000. Engraved and Nickel Plated Colt Medium Frame Lightning Rifle that Belonged to Porfirio Diaz, estimated at $25,000-45,000. Colt Single Action Army Revolver with Ivory Grips Engraved by Wilbur Glahn (Sepulveda Collection), estimated at $75,000-125,000. 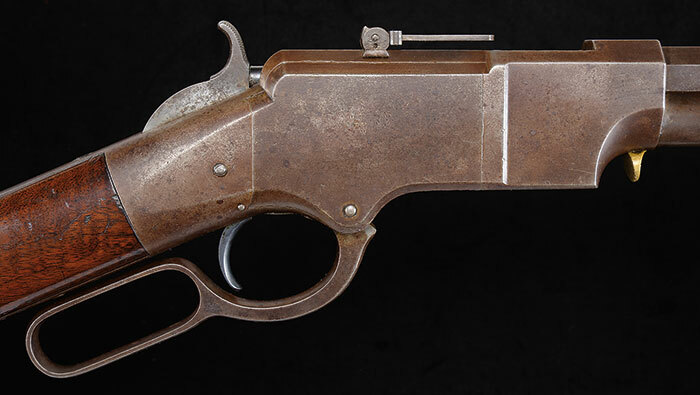 Springfield Model 1873 Saddle Ring Carbine that Belonged to Custer's Bugler, John Martin, from the Battle of the Little Bighorn (Swanson Collection), estimated at $175,000-275,000. 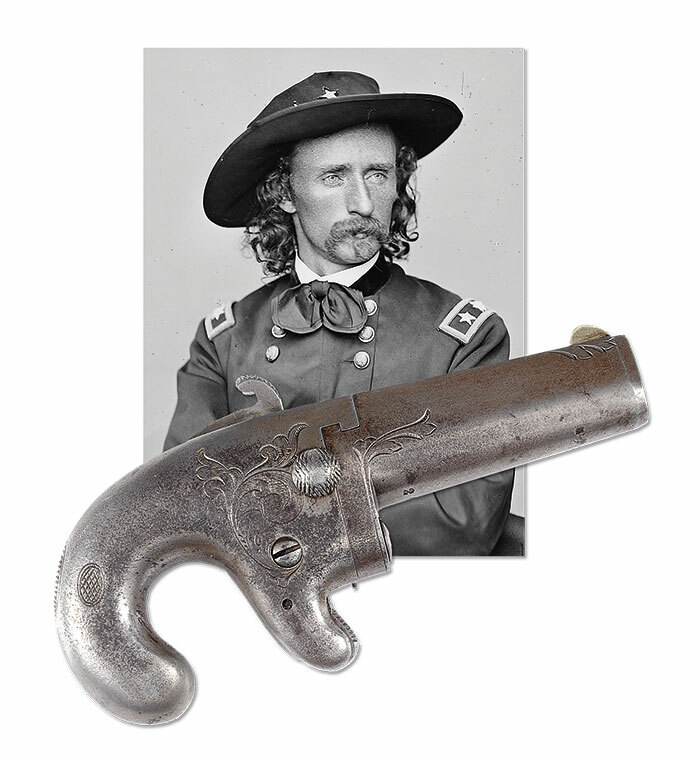 George Armstrong Custer's National Arms Company Deringer (Racker Collection), estimataed at $20,000-30,000. Extremely Rare Cofer Percussion Confederate Revolver with Original Cofer Holster (Racker Collection), estimated at $100,000-150,000. Historic Silver Mounted Hawkens Rifle of George W. Atchison, estimated at $80,000-100,000. Rare North & Cheney Flintlock Pistol, SN 816 (Racker Collection), estimated at $30,000-50,000. Extremely Fine A. H. Fox "FE" Grade 20 Gauge Shotgun with Special Gold Inlays (Tauber Collection), estimated at $150,000-225,000. Exceedingly Rare Parker Brothers "A-1 Special" 20 Gauge Shotgun, estimated at $95,000-150,000. Winchester Model 21 Custom Shotgun Presented to Five Star General and First Chairman of the Joint Chiefs of Staff, Omar Bradley, estimated at $100,000-200,000. 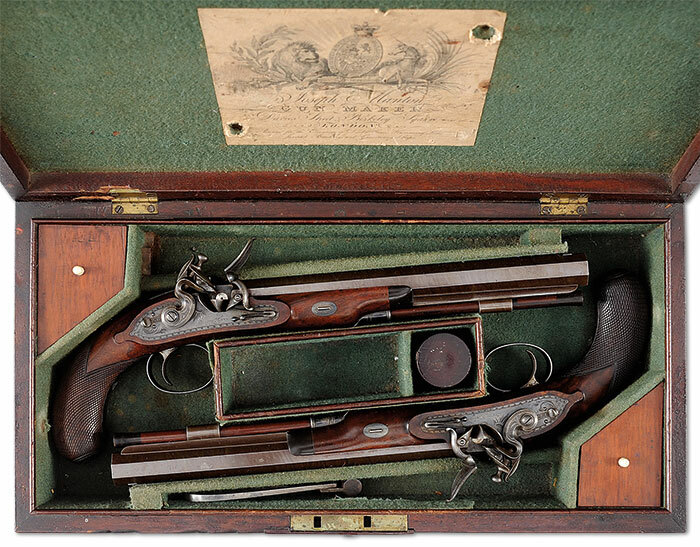 Pair of Cased Joseph Manton Flintlock Dueling Pistols, estimated at $30,000-40,000. Alexander Henry Double Rifle Presented by Queen Victoria to John Brown in 1873, estimated at $50,000-80,000. 1235 with 14 Gold Bird Inlays, estimated at $50,000-75,000. 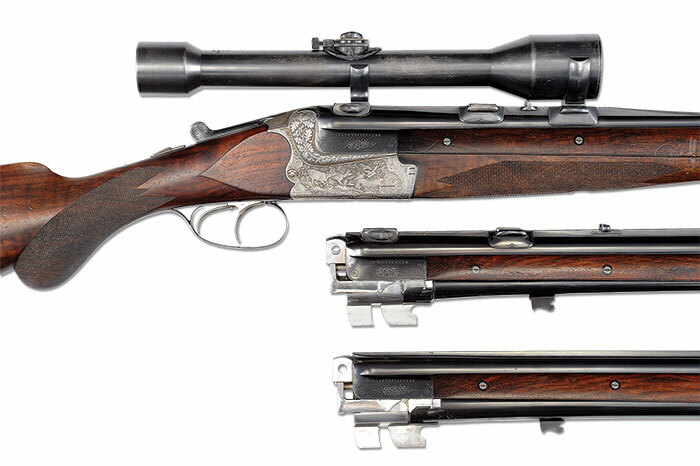 Herman Goering's Merkel 201E Over-Under Blitz Ejector Double Rifle, estimated at $75,000-100,000. 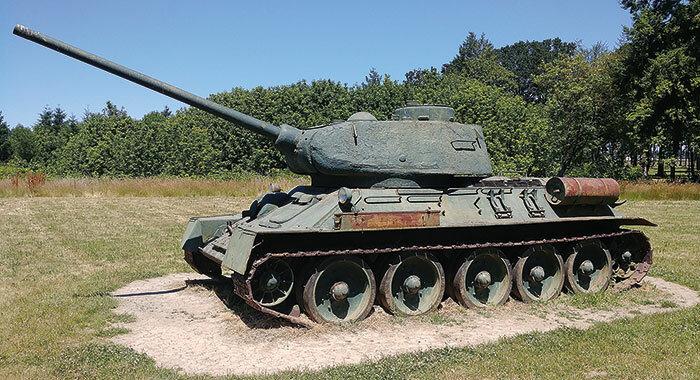 Rare and Desirable Soviet T-34/85 Tank, estimated at $45,000-85,000. Maxim Nordenfelt 37MM "Pom-Pom" Naval Deck Gun, estimated at $125,000-200,000. 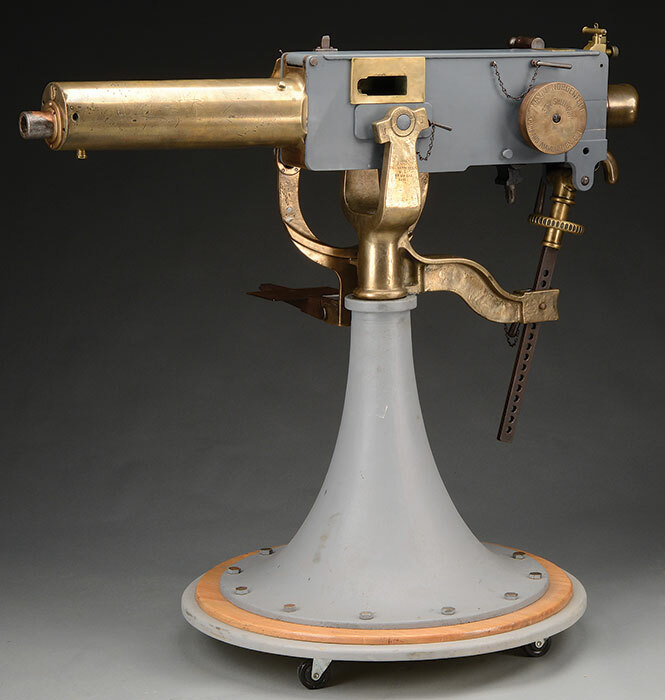 Exceedingly Rare Colt Monitor Machine Gun, estimated at $50,000-75,000. 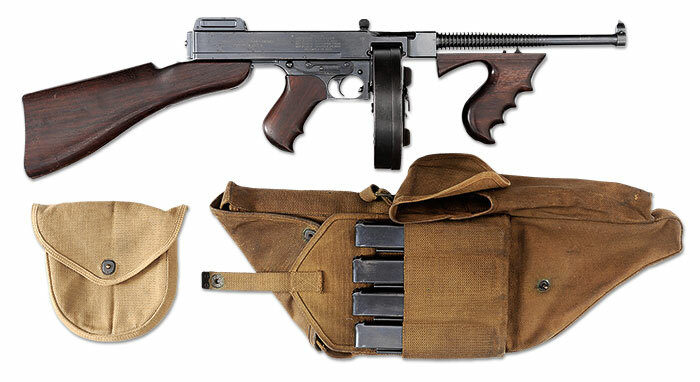 Early Colt Model 1921 Thompson Machine Gun, estimated at $45,000-60,000.